Now that the Affordable Care Act (ACA, Obamacare) has beaten back all judicial challenges, it is worth revisiting its vast success. A single-payer system would have been far preferable. But the present system is substantially better than nothing. As Jay Bookman pointed out in early May in the Atlanta Journal-Constitution, none of the dire predictions of its critics have come true. There has been no jump in health-care costs. In fact, medical inflation has leveled off. The number of people who lost their insurance was no higher after the advent of Obamacare than it had been in previous years. It hasn’t killed employment– rather employment is up. Let us consider the success of the ACA. 1. 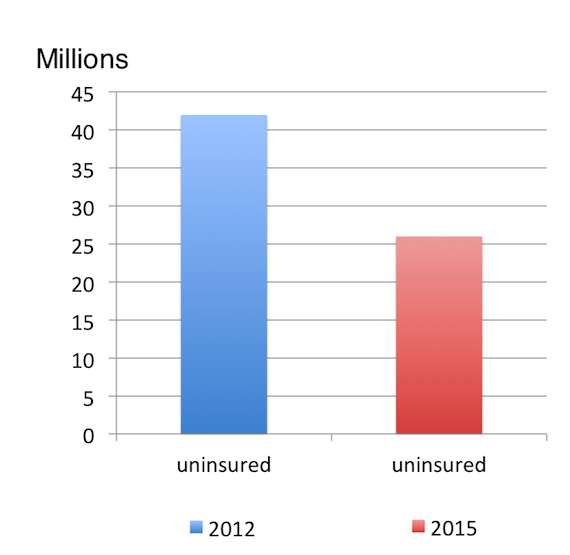 Rand reports that in summer of 2013, there were 42 million uninsured Americans. By February of 2015, that number had fallen to 25.8 million. That is, nearly 17 million more Americans have health care than before Obamacare. 2. With regard to percentages, the country’s uninsured rate was 17.1% in 2013, and it declined dramatically to 11.9% during the first quarter of 2015. 3. People without health care are in a very uncertain situation– they could have a medical emergency any time, and they have nothing to pay the hospital with. They also don’t get preventive care because they don’t pay to go see a doctor if they don’t have to. Obamacare will save an estimated 24,000 lives a year. Obamacare, some of which is covered by medicaid expansion in sane states, should have the same effect, enriching these lives and enriching us all.